THE NEXT in this season’s bumper list of Calderdale derby games will be at North Dean on Saturday when Heath face Old Crossleyans (3.0). This weekend’s hosts ground out an 18-14 win at Broomfield on December 1 when the Crocs were top of the table and Heath third. Dave Harrison’s West Vale side have shown the better form since and will be looking to maintain their 100 per cent derby record this season, having already completed doubles over Old Brodleians and Old Rishworthians. Their main aim, however, is to nail down second place behind Moortown to earn a promotion play-off game. Harrison was pleased with Heath’s display at Dinnington last week, when they collected a bonus point win against a side with a solid home record. Selection for the Crocs game has been hindered by injuries to front rower Chris Moore and Jonny Cole, while fellow back rower Jason Merrie has not fully recovered from an ankle injury sustained three weeks ago. However, prop Chris Piper returns. After a narrow escape from relegation last season, Crocs had won 10 out of 11 before the first meeting but have won five, lost five and drawn one since. Club spokesman Howard Cooper said that it would be refreshing for the Crocs players to approach this match as underdogs. He said he had noted reading Harrison’s main aims for the season in the ‘Courier’ earlier in the campaign; promotion or at least to make the play-offs and to beat all the other Calderdale clubs home and away. Cooper said Heath deserved credit for looking likely to achieve the first goal but all the pressure would be on their players in their quest for the second. “We will be going there looking forward to the contest and to enjoy the challenge and hopefully give it our best shot. Rishworthians have a “must win” game at home to Selby on Saturday if they wish to beat the drop. With Guisborough virtually doomed they are battling with Hullensians to avoid the second relegation spot. 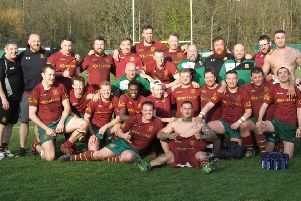 The Hull side picked up a losing bonus point at Old Crossleyans last Saturday to take them three points clear of Rishworthians, who came away empty-handed from Middlesbrough. Selby are above both of them, having performed their usual escapology act at the end of the season. It was a disappointing trip to Middlesbrough for the Copley men, who left themselves a mountain to climb after a poor opening quarter, but they did feel decisions went against them, especially at the end, when they might have expected to get a penalty try which would have gained them two points. Although Harvey Keighley-Payne is unavailable, Callum and Doug Heseltine, Anthony Shoesmith, Luke Flanagan, Sam Bake and Ed Cockroft are back in contention. Old Brodleians travel to Pontefract tomorrow for a clash between teams who have been in the top six all season. Pontefract have possibly performed above their expectations following promotion last season and sit third with three matches left. 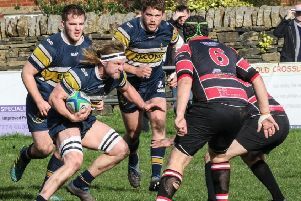 The Carleton club’s promotion chance looks to have gone after a 23-21 defeat at Selby last week but they haven’t lost at home since leaders Moortown beat them 26-24 in December. Pontefract won 22-18 with a late score at Woodhead earlier in the season and Brods must be aware of the threat posed by their pack, led by Gaz Burns, who even in defeat last week scored a hat-trick of tries from rolling mauls. Brods backs coach Neil Sheard, in charge on the touchline last Saturday with Ollie Akroyd required to play in the 39-12 home defeat to Moortown, is keen for the Hipperholme side to finish the season with momentum and has not given up hope of a top four place. Danny Vento, Pete Williams, Phil Town and Matt Carbutt are among the players who could return this weekend.